Wildlife control in Bury can be necessary in a number of circumstances. There are several types of wildlife that need to be controlled to maintain the natural balance in an area. In many instances it is necessary to protect the surrounding woodland. Landowners have a regulatory responsibility to manage rabbit populations on their property. Foxes often move into residential areas and they too must be managed. This is necessary as there are a number of diseases that foxes can pass on to domestic animals. Feral mink threaten fisheries, ponds and wildlife nature reserves. Deer can cause damage to crops and woodland if their numbers are not managed. Most importantly, it is necessary that any control measures implemented with these animals are humane and fair. In Bury, wildlife control should be undertaken by professionals that understand the law and regulations. Pro Kill Environmental is such an organisation. They have an intimate knowledge of the law and nuances governing the management of all types of wildlife. They take an integrated management approach when it comes to the control of wildlife and are committed to sustainable and effective solutions. Pro Kill Environmental has the expertise and experience to deal with all types of problems. When you have a need to address any wildlife, bird or pest problem, they can help. Wildlife control in Bury is one of the services offered by Pro Kill Environmental. 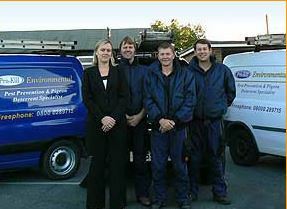 They are passionate about what they do and can offer solutions for all your pest issues. If it is timber preservation you need, they can assist. They have an extensive knowledge of the different types of insects that could be damaging your timber, and will solve your problem efficiently and effectively. Whether it is wasps, fleas, rats or bedbugs that need addressing, contact Pro Kill Environmental. For more than 25 years they have been addressing pest issues such as wildlife control. They can offer the advice you need and a practical solution to resolve your issue. Call Pro Kill Environmental when you have a pest control situation. They are registered and affiliated with many organisations, such as the BPCA. For more information about effective wildlife control, contact Pro Kill Environmental. This entry was posted in Pest Control and tagged Bury Wildlife Control, Wildlife Control in Bury. Bookmark the permalink.